This is 2 wheel smart car robot chassis DIY kit. It comes with the 2 pairs of BO Motors and Wheels. All the products included in this car kit are quality products. 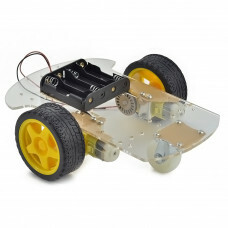 The chassis used in this kit is transparent so as to create dynamic handling of the components mounted on your robotic vehicle.